This review is a cross-post from Playtest. Love Letter is available through Amazon and Funagain Games. Love Letter falls into two unusual categories, the first of which is Games That You Are Convinced Won’t Work Until You Play Them. Often these are games that are so complicated that you can’t visualize how all the disparate systems could possibly come together into an organic whole, but sometimes you come across a game so simple that you can’t imagine how playing it would be any more intriguing than flipping a coin. The second unusual class into which Love Letter falls is what I call Two-Minute Games — not because they can be played in two minutes, but because they feature such an economy of rules that they can be taught to others in that limited time frame. Love Letter is so simple, in fact, that I bet I can explain the core rules in 25 words or less. “Draw a card on your turn, then discard one from your hand. The discarded card takes effect. Have the highest ranked card at round’s end.” Done. Were I actually teaching you the game, of course, I would open with the premise. Each of the 16 cards in the deck depicts a member of the royal household, which is composed of the Princess, the Countess, the King, two princes, two handmaidens, two barons, two priests, and five guards. In an attempt to woo the Princess, you have entrusted a love letter to one of these people, who has agreed to pass the missive along. Ideally your letter will be in the hands of the Princess herself by the end of the round; barring that, you just want your letter to be as “close” to the object of your affection as possible. Each member of the household has a rank from 8 (the Princess) to 1 (the guards), and you win by holding the highest ranked card at the end of the round. Everyone receives a single, random card before play begins. On a turn, a player draws a second card and then discards one of the two from his hand. The discarded card has an effect, depending on the person shown. A Guard, for instance, allows you to name a player and a card; if the target holds the card you specified, he is out of the round. The Priest allows you to look at the held card of an opponent. And the Princess, the optimal card to own when a round ends, comes with a liability: you are eliminated if you discard her for any reason. There are only eight abilities, one per role, and yet the interaction between them make for a tense game of bluff and deduction. Take the three roles described in the paragraph above, for instance. 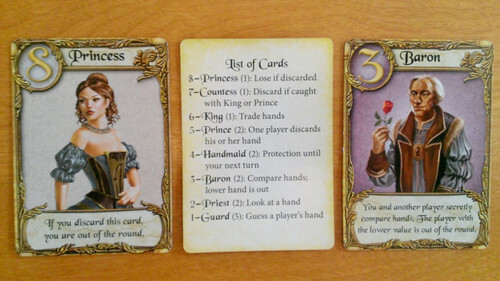 Discarding the Priest, a player could look at the hand of an opponent, and perhaps discover the Princess; if he holds (or draws) a Guard on his next turn, he could then single out the same player, “guess” the Princess, and force him to discard it (thus knocking him out of the round). But the other player will first have a turn to react, and may discard the Handmaid, thereby becoming immune to all attacks until his next turn, or the King, which would allow him to trade his hand with any other player, handing them the Princess (and possibly the victory) whilst weaseling out of the crosshairs. Love Letter does not contain an abundance of game; play a round or two and you’ve pretty much seen the gamut. But that won’t prevent you playing compulsively, and enjoying every game. The design strikes a deft balance between subtlety and brainlessness, allowing you to play even while mentally fatigued from earlier, weightier games, or a bit hazy after that second margarita. Indeed, with its simple rules, compact size, and quick playing time, Love Letter is a near perfect bar game, so long as you don’t mind the stares of the other patrons as you howl with laughter at the reversals of fortune, and rage against the perfidy of your erstwhile “friends”. Like a hapless suitor, pouring his heart into a billet doux, you will likely become quite enchanted with Love Letter. The infatuation may not endure, but you’ll be hopelessly smitten while it lasts.